The novel reveals a piece of the life of the great Spanish painter Francisco Goya where his muse Inès is blamed to be heretic by the most powerful monk Lorenzo. Torn between the irresistable passion to the gorgeous Inès and the duties to God Lorenzo is in a trap and finds salvation in France. Fifteen years later he comes back to Spain, now being a protecter to the revolutionary ideals... Francisco Goya is a perceptive observer of that religious passion, love, betrayals, delusions and illusions. 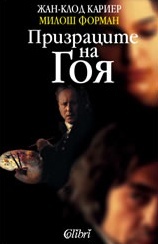 The autors Jean-Claude Carriere and Milos Forman turn this dramatic story into a movie in 2007. Jean-Claude Carrière was born on September 19, 1931 in Colombières-sur-Orb, Hérault, France. He was a frequent collaborator with Luis Buñuel. He is president of "La Fémis". Some notable screenplays he has written or co-written include: "Belle de Jour", "The Discreet Charm of the Bourgeoisie", "Milou en Mai", "The Phantom of Liberty", "That Obscure Object of Desire", "The Unbearable Lightness of Being", "Valmont", and "Chinese Box". He also collaborated with Peter Brook on a film version of the ancient Sanskrit epic, "The Mahabharata".